Louvers can be operated either manually or automatically (pneumatically or electric). As an affluent name of this domain, we hold expertise in providing high quality Steel Louver. Dhiman Steel is offering clients a wide range of Steel Louver. Steel louvers mfd by using M.S.CRCA sheet / G.I sheet having outer frame wide fully panelled with ‘Z’ shape louver Blades Horizontally to give perfect Elevation & The offered louvers are available in different specifications to meet various requirements of thier clients. We are providing good quality Steel Lovers (Grills) at an affordable price. With the efforts of our professionals, we are able to manufacture superior quality Galvanized Steel Louvers. 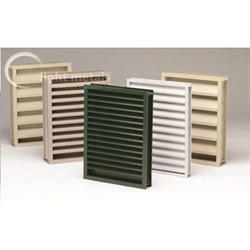 These Galvanized Steel Fix Louvers are made from high quality of raw material which ensure durability at its user end. These product are available in market at competitive rates. -30 mm and and thickness is 18G 2. LUYERS : In case of Steel Luyers they are made of 1.00mm thick steel strips pressed for reinforcement. In case of glass Luyers suitable glass holding clips are welded in the frame for holding the glass.